It is a feeling that you kinda get addicted to - the good-pain in your hamstrings, calves and quads and it lasts for a couple of days. Last week I had just enough time to restore harmony with my Quads, ankles and lower back after the Nandi Hill ride. The gear I packed on Tuesday was a rather unusual mix of leather jacket to dry fit apparel, ankle boots to new shooz, spare tube to Polar HRM. For, what I had in mind was a ride to Srirangapatana, run, ride to Mysore and run up the Chamundi Hills the next morning. It is the season of patriotism, of ChakDe India, of a test victory over the British, of a strengthening rupee. I bought myself a Tricolor to celebrate the spirit of Independence. For the first time, I stitched the Saffron, white and green stripes to size, biting my tongue at those anxious moments when the crucial stitch had to come right while pedaling the Merit sewing machine delicately. After an hour’s battle the Flag adorned the rear view mirror of the Bullet quite smartly, my Laksh was achieved!! 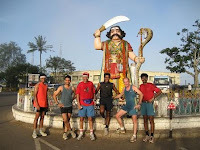 The Forrest of RFL, Dr. Rajat came up with this idea of running up the Chamundi Hills on 15th Aug. Sunil and Jugy added the Hash angle to it, by planning a run near Srirangapatana on 14th, stay over at Mysore and then scale up the hill in the morning. And the plan came with the hash promise of serene landscape along the Cauvery river. Just before the Rangantittu bird sanctuary there is a kachha road that runs along a Cauvery canal. 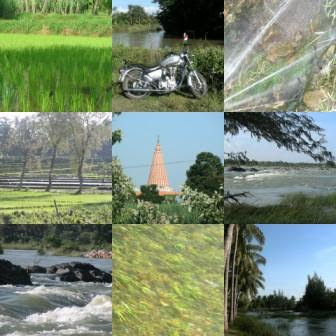 As Sunil & I took this route to chalk the trail, the landscape opened up to some wonderful imagery of paddy and sugarcane fields along the canal. About 5-6kms on this route and then we took a road to an Ashram and a village. Beyond the village, was the river flowing close to its brink, thanks to the good monsoons this year. By 4 in the evening the critical mass had gathered for the run – Sunil2, Dave, Mike, Leona, Uttam, Sindoor had joined us. Later Abnash and family and Nischal caught up with us. The run was fantastic, about 7.5kms of bliss. 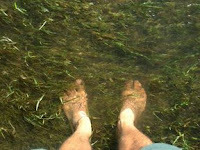 We chilled out at the river for sometime, soaking the sore feet in the cold waters and headed back before sundown. Dave shot some excellent pictures of my bullet on his Canon SLR, see if I can get my hands on those. I wish I could put up some of the pristine country air for you to sample or better still save some for myself. I was booked at Dasaprakash at Mysore for the night. We treated ourselves to a finger-licking buffet and Beer at The Metropole. The RFL team from Bangalore joined us during the night – Doc, Bhasker, Satsang, et al. At 6am we were about 18 of us running up the Chamundi Hills. The Chamundi hills 3490ft high aberration in the center of the city of Mysore, boasts of rich historical significance and the famous Chamundi temple. The uphill climb is 6km around the winding road to the top. Most of us managed a good timing of 39-42mins on the first lap (yes, we ran it up twice!!) and 22mins on the downhill. It was the second lap that was the push. I did an additional 3kms when I accompanied Nischal on her second lap. I still have the can’t-say-no-to-beautiful-girls disorder. 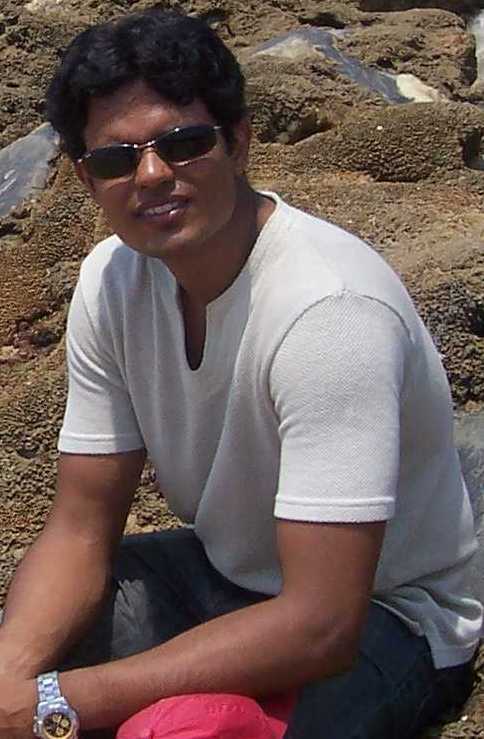 Bhasker kept us company as well on the way down sharing his marathon experiences. Breakfast served after a 27km run will generally taste good anyways, only Sandesh Prince made sure they didn’t screw up. They have a breakfast buffet which is value for money really… I am not sure, thou, that they continue to offer that after the RFL Raid on Independence Day!! I was spared the traffic on the ride back to Bangalore and made it non-stop in 2hours 15mins.